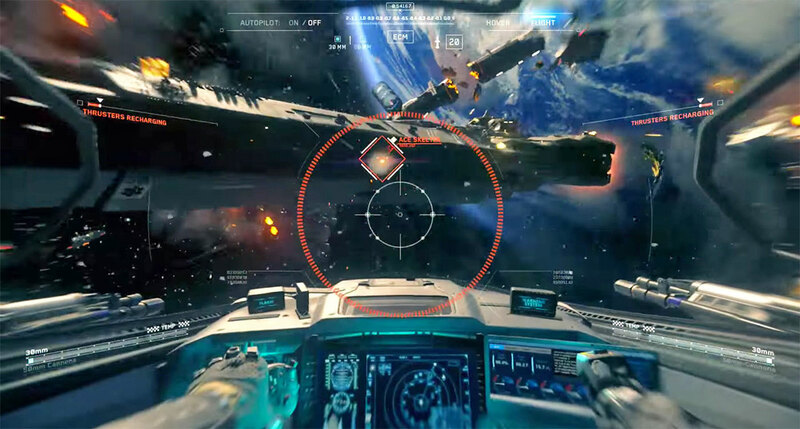 There's just no better way to shoot down enemy spaceships. There's already plenty to look forward to in Call of Duty: Infinite Warfare due out on November 4th: Space, futuristic weaponry, rifle customization, enhanced multiplayer modes and a bit of Jon Snow. While I missed the opportunity to try the game at the Tokyo Game Show this week, I did come across Jackal Assault, a PlayStation VR freebie that comes with the CoD title. And it didn't take long before I fell in love with this space dogfight demo. More importantly, I didn't feel sick at all, which is surprising given the speedy maneuvers I managed to pull. There's no gameplay footage of Jackal Assault at the time of writing this article, but most part of the demo I tried was very similar to what's shown in the above CoD footage (from 1:35 to 3:05). The game puts you inside a Jackal fighter jet, where you have a bit of time to look around the launchpad. Moments later you're shot into cold space behind a fellow Jackal, with Planet Earth staring right back at you. You're then tasked with a simple debris removal job to get you familiarized with the controls, which are straightforward on the PS4 controller. Suddenly, an anomaly is detected nearby, and you end up being ambushed by a fleet of similarly-sized enemy spaceships plus their large but stationary battleship. That's when the game really begins. Soon I found myself taking full advantage of my 360-degree view to track down enemies while flying smoothly at full speed, and occasionally braking to make sharp turns in the debris field. There was certainly no shortage of adrenaline throughout the game. Interestingly, at no point did I notice any nausea even while moving my head around, so I could simply focus on pointing my Jackal at the damn things to shoot them down with my rounds and missiles. Every explosion put a smile on my face. That was until the demo got cut short by a black hole that came out of nowhere and sucked everything in. Given how simple yet thrilling Jackal Assault is, I wouldn't mind a longer demo, but then again, it was a good time for me to wipe away my sweat.